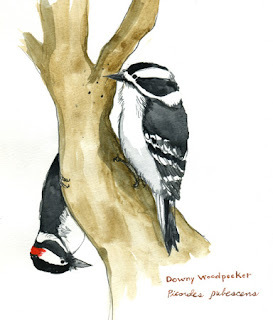 Downy woodpeckers are fairly common in wooded areas in Chicagoland. The males and females look similar except for a bright red patch of feathers on the back of the male's head. I used to hear one drumming away on a regular basis on some of the older trees in my north Chicago neighborhood. FYI -When I created this painting, I didn't realize that it is incorrectly depicting some woodpecker behavior. Woodpeckers do not climb down trees head first. Nuthatches have the ability to do this, but not woodpeckers. So shame on me for this false image!